A certificate of recognition is awarded to the person who performed excellence in his/her work. This is an award for showing achievement and excellence in work, in any job assigned or in any professional expertise. The certificate of excellence is given to admire and recognize a person’s performance. Appreciation and praising for any individual boosts his/her capabilities to perform even better in future. 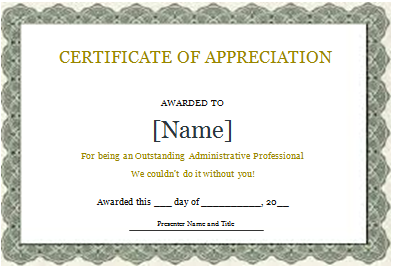 Business organizations and companies use this type of certificates to acknowledge the abilities and performance shown by the employee/s by awarding him/her with this certificate. School, college, and universities can even use this certificate to award those students who show brilliant academic performance. In sports, good athletes can be awarded this certificate. This certificate can generally be used by any department where individuals are admitted to be performed excellently. We have prepared a sample certificate of recognition template for all those departments who serve this to the employees or individuals showing good results in any field of work. The sample certificate provided here is simple but covers all that requirements for which it is made. It is prepared using MS word that makes it easy for the user to make changes in it as per his/her requirement. It can be downloaded very easily by just clicking on the link. Sample preview is also given to having a quick look at its appearance. The certificate is completely friendly to be customized. It can also be printed very easily.